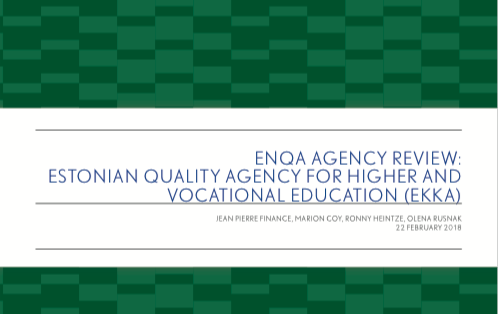 In autumn 2017, EKKA underwent an assessment by the European Association for Quality Assurance in Higher Education (ENQA). On the basis of a thorough Self-Evaluation Report as well as interviews conducted in Tallinn, the review panel compiled an Assessment report and the ENQA Board adopted in March 2018 the decision to renew EKKA’s ENQA membership until February 2023. 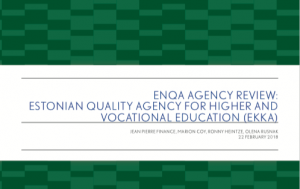 The only standard, for which according to the ENQA Board EKKA’s review outcome was not the highest possible, pertained to requirements to the internal quality assurance at higher education institutions. This shortcoming has already been eliminated in the new institutional accreditation system, which gives particular emphasis to quality culture and internal quality assurance at the higher education institution. Furthermore, the review panel recommended a learner-centredness requirement to be introduced to the guidelines for initial assessment. Although the study programme has not yet started admissions, the assessment should look at the paradigm for learning and teaching chosen by the higher education institution. EKKA deems this a good suggestion that we intend to implement I n the future. On top of that, the review panel recommends EKKA to provide training to members of the Higher Education Assessment Council in the field of quality assurance in higher education. As the council members bear a lot of responsibility, the review panel deems that it is EKKA’s task to support their development, taking into account their previous experience, educational background and the like. Most of the recommendations made by the panel only reaffirms the relevance of EKKA’s chosen path for future developments. One of those would be the thematic assessments envisioned in the new assessment concept that will result in analytical reports and sharing of best practices. A positive review result also means a renewal of EKKA membership in EQAR. Erasmus+ strategic partnerships deadline is approaching!